Car Rental – Book these way in advance. Last minute bookings usually mean $100 a day and often unavailable. We booked ours a month in advanced and we did so using priceline. It was our first time using priceline, a little nerve racking, but it worked out to our advantage. We bid $13 a day for a mid-size car, and got it. After taxes, it worked out to be $20 a day. When we arrived, they were out of midsize cars, and we ended up with a convertible. A great deal! I recommend bidding on priceline as early as possible. Hotel – Again, book as early as possible. A hotel is often cheaper when you book it together with your flight, rather than booking it individually. There are countless condos (vacation rentals) on the island – pros: full kitchen, laundry. cons: cleaning fee, no daily maid service. The cost works out to be about the same. Some are listed on craig’s list. Josh at Kauai Exclusive helped us find a swanky condo at Waipouli Beach Resort, and we absolutely loved it! Considering the cost of food on the island, having a kitchen is really handy! The guide book below has a detailed list of rentals and reviews. I recommend checking there first. Bargain for multiple nights and multiple bookings. 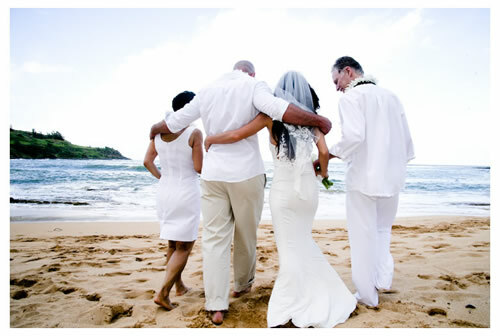 Guide Book – “The Ultimate Kauai Guidebook” was recommended by our friends who also got married on Kauai. When you’re there, everyone is holding a copy of this book. Colorful, informative and very well written. I would skip the Lonely planet and get just this one book. Must See Sight – “Kauai Hindu Monastery” (p63 in guide book for directions) – This place is extraordinarily beautiful! Open daily from 9am to noon. We highly, highly recommend getting a guided tour, this is the only way you can visit the garden/forest section of the monastery containing all kinds of beautiful and rare vegetation. The tour is free, happens only once a week and you need an appointment (888-735-1619). We dropped in a few mornings to meditate and to participate in the pujas. Use mosquito repellent before you go (I didn’t and was bit, many times). Photography Emily Helen, Kauai Wedding Photographer Hands down, Emily is the best person for photography on the island. She combines commercial fashion photography into wedding portraiture, really clean and beautiful. She also charges a lot less than many of the crappy photographers on the island, trust us, we’ve looked. Hair & Makeup Christie at Main Attraction Hair Studio. Christie is really sweet and thoughtful. She can come to your hotel room to get you all prettied up. Or you can make an appointment to visit her in the salon. It’s cheaper to visit the salon. For my nails, I had a french manicure at the plaza across from the salon for $22. The place is called Acrylic Nails & Lucy Alterations, (808) 821-9009, Wailua Plaza. Cake – We really debated with the cake, having the option to get it from Icing on the Cake. But because we had a small party, one could get a simple cake from safeway for much cheaper. $70 vs. $18. We chose the latter. We order 2 cymbiduim orchids at $5 a piece and a bunch of small white orchids ($0.20 each) and decorated the cake ourselves. Flowers – “JC’s Flowers & Mini Mart” is a small family run shop that many locals recommended, based on our research, they were also the cheapest, especially if you know exactly what you need. 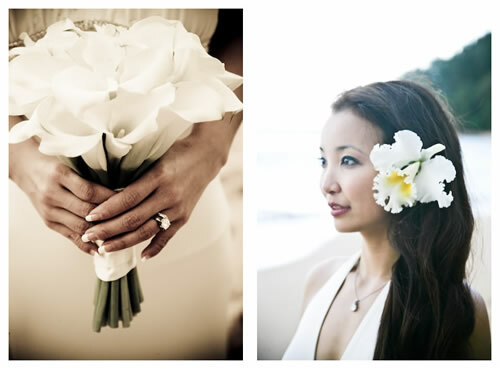 The bouquet of mini calla lillies (30 flowers) costed $130, cheapest you’ll find on the island. (808)822-5961, Attached to Wailua Plaza. Dinner Reception – We went to The Beach House. This place is super popular, make sure to reserve way in advance, else you’ll get late seatings. Get a table beside the window and you can hear the sea crashing on the beach. Roughtly $50 a person with wine, so-so (slightly annoying) service, but exceptional food. I recommend the Sea Scallops. This entry was posted on Thu, Feb 26, 2009 at 3:31 pm and is filed under Beauty, Photography, Relationships, Tina, Traveling. Email this page. Congratulations, I’m surprised but happy for you Tina! You look so stunning Tina. These pictures are amazing (as a photographer I’m sure you appreciate them even more) and the landscape simply priceless. Thanks for sharing them with us. Wishing you both much love and happiness, growth and peace. Congratulations! You both look so happy and those photos are so sweet! May your joy, peace & strength in each other know no bounds! I was just thinking a few days ago, “Where has Tina been lately…” What fantabulous news this is! Finding someone who creates that soft place for you to fall is one of life’s miracles. I am so happy for both of you! Oh that is so sweet. I was just in Kauai at the same time. I think we shared the same island for a while. Would have loved to run into you and you “hubby” since I read your posts all the time. 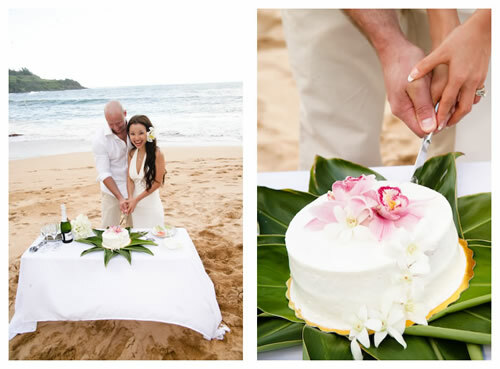 If I ever get married , a ceremony Kauai will be right at the top of the list. You two are gorgeous! You were made for each other. Thank you Tina for all you have done! You are awesome! Hot Damn Congratulations you two! Beautiful photos & a very handsome couple. congratulations! and best wishes for a long and happy life! Wow, Congratulations to both the newly weds. You’re looking beautiful and gracious. The pictures are worth expressing the joy and happiness. Wish you all the very best in life. Keep writing. Congratulations to both of you :) I’m sure the photographer was talented, but I believe that your beautiful pictures are due to you both…you both look so happy and so at peace. I think each of you let your inner light shine, and it just beamed outward. This reflected in your pictures, as I’m sure it will reflect in your life together. I wish you much love and peace and happiness, singularly, and as one. Stunning pictures! I’m from NYC and I have been to tons of weddings but your ceremony pictures are one of the best I’ve ever seen. Nothing like surrounding yourself by nature in all its beauty and splendor. I especially love the cake! Thank you for sharing your story. All women should learn to love themselves before they can bestow it on someone else. May you live happily ever after…. My congratulations! May your life together be so beautifull and abundant and fullfilling as the nature that surrounded and witnessed your sacred ceremony! Me again. Left a post on your other blog. Just to add that the pictures are beautiful and love and tears are truly in the air. Lovely, touching, pictures. 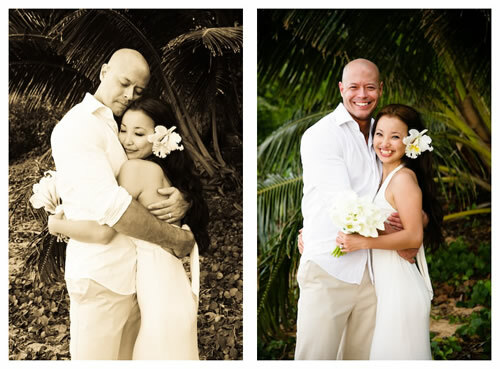 Glad we could see how true love manifests itself in these wonderful pictures. congrats to you and thank you for sharing your beautiful photos. you are as beautiful on the inside as the outside. Lovely! May there be much happiness and growth ahead for both of you. Oh my gosh, you both look so adorable. The last picture was beautiful, it looks like something you would see in a magazine. Congrats! Know what you mean about love when you least expect it. After about a year of dating and nearly 9 years of friendship, I proposed on Valentine’s Day – our wedding should be around September. All quite exciting. Best of luck! You’re pictures are all great, but the ones that feature your smile are fantastic! Congrats! 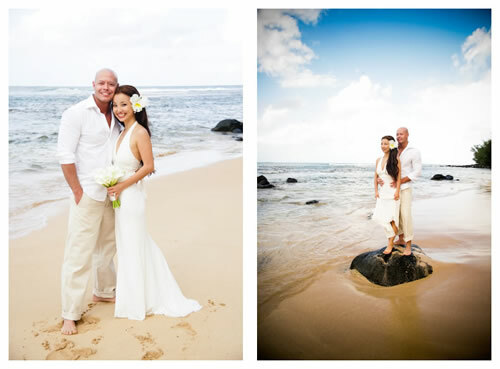 Kauai is fantastic, my wife and I got married there December 2nd, 2008. Thanks for the travel tips as well, we hope to return sometime soon! It rained during our ceremony, (slightly) and we were told it’s a blessing from the Gods (although we’re sure they tell that to everyone). It was the best day of my life without a doubt. Congratulations ! The pictures are wonderful. One of the most gorgeous, beaming smiles I have ever seen! What a fantastic looking guy! Tina, very insightful thoughts in regard to planning the wedding. I was a minister for almost 20 years, so I have seen the stress right up close when folks try to have a huge or “perfect” wedding. It’s especially diificult when there is a parent (usually the Bride’s mom) who puts pressure on for perfection. It’s all over in a few hours; the relationship should be forever. If the relationship isn’t worked on even half as much as the ceremony, then ultimately, the ceremony and all the obsession means nothing. Think of all the generations where there were only family and a few friends involved and the bride simply wore a nice dress. These were our parents and grandparents. One shouldn’t buy jeans to impress others nor do big weddings! You both look remarkable – just like in a happy end of a movie. The only difference is that it’s your beginning. I wish you an amazing time together and loads of happy moments – after all, marriage isn’t the same without them! Those pictures are so beautiful Tina! I can’t tell you how happy I am for both of you. Wow, congrats! Your wedding looked very intimate and special…as it should be. Simply simple and beautiful. hahaha… thank you! You made me laugh with this comment. I agree and feel that he is very handsome. Thank you for all your warm wishes. Your comments have truly made my heart smile. Big love to you!! Oh wow….your pictures are so romantic!! It sure looks like you are made for each other! Beautiful!! I’ve been reading your blogs for several months now and it’s helped me a lot. Seeing you SO happy and full of joy and life it’s so good. You’re a great inspiration, and all the happiness in your life is well deserved. And thank you for all the wonderful things you’re sharing in this site. 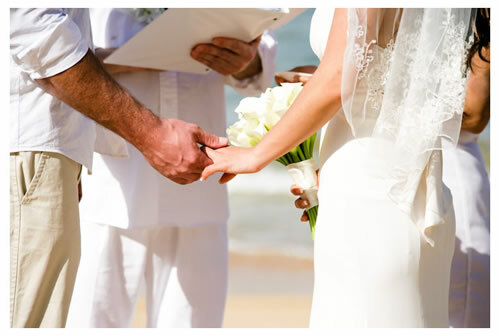 Tina, the intimate wedding experience you share through these photos enables your readers to feel more connected to you and the web of universal love. We share a soul journey. Love is a universal language that reminds you what matters. Everyone is connected through a thread of eternal joy. Thank you for reinforcing the power of compassion, light and bliss. Everything you write works magic to bring people together. Good Lord, what a gorgeous couple! It makes me want to go out, TODAY, and find the right woman. You have proven that to have a beautiful wedding you don’t need to spend so much. I think they are the most beautiful pictures I’ve seen. I want to wish you both the best. Thank you so much for sharing them. Wow I just found your blog. Great post, congratulations, inspiring too! Loving the art of self love. Thankyou! The facebook photo link seems to have expired, would you be able to repost? Thanks for letting us know. I didn’t even know the links could expire. I’ve just updated the facebook photo links. They should work now. Thank you for sharing your lovely photoes with us and also congratulations and hope have great and fantastic days with each other. I would pray for you!!! oops I didn’t realize I was on your personal site… sorry. 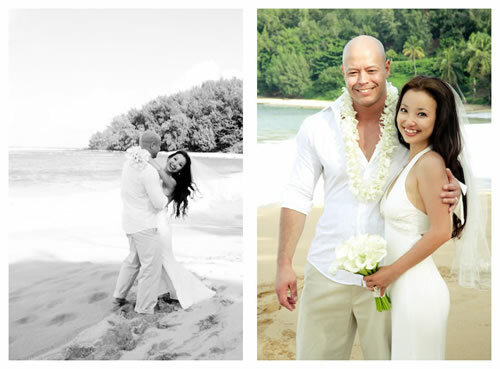 I am getting married in Kauai this coming Saturday and just wanted to say a big thank you to you for posting your absolutely beautiful and wonderfully helpful wedding info here! I found my dream photographer, Emily, due to your high recommendation! We are having a tiny ceremony/reception at the Beach House restaurant (that’s how I came upon your site when googling). You and your husband seem like two people who truly understand what the meaning of a marriage is and did not let any frills get in the way of what a wedding really should be about! I like to think we are the same way and I hope we don’t forget it the day of! You look absolutely stunning. I live in Italy and we have a saying here: the sun shines on the beautiful. That’s why your face is illuminated in your pictures. A marriage is like a journey and my family and I wish you bon voyage. Sam’s has some very expensive, quality jewelry and they are “honest”. Whatever you purchase there is guaranteed to be of superior quality. I often go to their site and drool over the amazing rings they have. I hope you find something you’d like to get for your wife there! Thanks for the great tips. But one thing I would like to know is who you got to marry you and did you bring and set up the table with the cake yourself? Everything did look beautiful. Well done also on how you handled the person who tried to sabotage the good wishes comments with a negative comment. It is part of the past and private, but you still responded with grace and honesty. I’m glad to share right now my happiness is thanks to a wonderful man I met in August last year. Exactly how you describe in your articles on relationships, when we least expect it, it happens :) I’ll share more sometime. This comment is more about wishing you & Jeremy all the happiness in the world. Wishing you God’s richest blessings of good health, peace and much love & happiness. You and your husband ‘re so beautiful!!!!! Hi Tina..! This is my first time visit your blog. It is so interesting! I am started to learn about happiness, law of attraction and something like that…. Your wedding is awesome.. congratulation Tina! What beautiful photos! You looked radiant. I just found your site and am finding such wonderfully inspired messages and stories. Thank you so much for sharing.